Loving Sairam from Heart2Heart Team. "The Police Constable and the Police Commissioner"
Through a beautiful example Swami explains today what is divine life. Once, when a number of people were asked by Me what they would like to be in the hands of God, I got various answers: some said the Lotus, some the Shankha (Conch), some the Chakra (Discus) but no one mentioned the Murali (Flute). I would advise you to become the Flute, for then the Lord will come to you, pick you up, put you to His lips and breathe through you and, out of the hollowness of your heart due to the utter absence of egoism that you have developed, He will create captivating music for all Creation to enjoy. Be straight without any will of your own, merge your will in the Will of God. Inhale only the breath of God. That is Divine Life; that is what I want you all to achieve. - Divine Discourse, April 1957. Loving Sai Ram and greetings from Prashanti Nilayam. This Sunday Special offers some reflections on a particular aspect of Swami’s recent visit to Chennai [concerning which H2H would carry an extensive coverage next month]. Our observations relate to some events that followed a public meeting organised by the citizens of Chennai to express gratitude to Bhagavan Baba for His gracious and speedy execution of the Drinking Water Project that finally offered substantive relief to the thirsty city. This public meeting held on 21st January, formally called Chennai Citizen’s Conclave, saw a battery of political bigwigs, normally used to throwing their weight and showing off their authority, sharing the dais with Swami in an attitude of reverence and humility. Understandably, there were a plethora of speeches by all the celebrities after which finally was Swami’s Benedictory Discourse. Swami was at His Divine best shall we say, making a powerful and forceful start with a reminder to humans that they are all aspects of the Eternal and Indivisible Atma. Swami has, of course, given this message many a time earlier, but it would seem that this was different. During the Kurukshetra war, Swami gave that message to mankind through Arjuna. On this occasion, gathered on the stage were politicians many of whom often clashed with each other, in the process dragging the country into unnecessary conflict. Thus, it seemed that this time the message was being addressed directly to the negativity lurking in all of us! In the course of His Divine Discourse, Swami, after stressing the need to rise above petty differences and seek unity, made a passing reference to the division of States that came about after Independence and the continuing passion to carve out more and more States for seemingly ethnic reasons but in reality more for grabbing political power. Swami of course did not make any reference to the political implications of the craze for dividing the country but merely stressed that it is in unity we can find progress, peace and prosperity. The Conclave received much media coverage – the TV cameras and the Press were there in full force. It naturally made front-page news in all the city newspapers next morning, and apparently, the news also made its way to many a national paper in the country since several charismatic leaders and some self-proclaimed atheists, shared the stage. By and large, the public reaction to the event as reported in the Media was quite positive. However, in one part of Andhra Pradesh, the reaction was negative. This rash emanated from a small political minority that for some time has been agitating for carving a separate State named Telangana, out of the present Andhra Pradesh. For some time, the claimants for Telangana had been agitating actively but lately, their cries became somewhat muted because there were not many takers for their claims. They thus had faded away from the front pages of newspapers and prime time TV news. Swami’s Discourse, gave them a new opportunity. How? 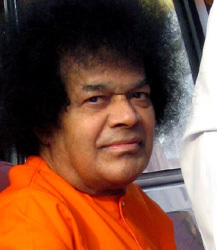 They took Swami’s remarks [as reported in the Andhra Press] to state that Sai Baba was opposing the formation of a separate Telangana State , thereby denying the legitimate aspirations of the people of these regions for self-expression. Based on this imagined and contrived interpretation [a distortion deliberately created], they started agitating and that promptly became front-page news in Andhra. There were protests and counter protests by people who argued that Swami was being unnecessarily dragged into a manufactured controversy, etc. These developments were totally ignored everywhere except in Andhra, because it was entirely a local issue but even in Andhra, the Media soon got tired and pushed it away. At this stage, Swami Agnivesh, now famous for his intemperate comments against Swami in the controversial show aired recently by NDTV, came to Hyderabad and made some remarks. We quote verbatim below, a newspaper report [this appeared in the Madras edition of TheHindu]. HYDERABAD : Noted social activist and president of All- India Arya Samaj, Swami Agnivesh has criticised spiritual leader Sri Sathya Sai Baba for his recent remarks favouring an integrated State. “He talked something that was unnecessary while ignoring an urgent issue – the killing of children at Nithari [in Uttar Pradesh],” Swami Agnivesh said at the dharna that he led against the killings, at Indira Park here on Wednesday. Swami Agnivesh is an ardent social activist, passionately committed to the issues he champions, and they are mostly valid and pertinent issues we might add. Like all people with fire in their belly, he naturally wants others also to share his priorities. The Nithari killings that Swamiji makes a reference to, came to limelight about a month ago, when it was discovered that dozens of young people [all from the poorer classes] who had been reported missing for over a year, had been secretly lured or kidnapped and murdered. Their mortal remains were discovered recently during a recent police investigation and that has subsequently caused a national furore and a wave of anger about how the poor are being callously treated and ignored. Yes, there is a lot of social injustice that needs crying out against, and Society does need activists who do that. Let us not forget that it was the persistent cry of many as far as one hundred years ago that led to a law against Sati, self-immolation by widows at the funeral pyre of their husbands. And in the twentieth century, it was Gandhiji’s constant cry that led to laws banning discrimination against people from the “lowest” class or caste. It is the duty of humans to raise their voice against injustice perpetrated by Society under various false pretexts. However, that does not mean that the Avatar too must follow the same path; Avatars descend to function at a much higher level. Consider malaria, a big killer in Africa . In dealing with malaria, it is obviously very important to treat people who have been struck by that illness. At the same time, it is obvious that the root cause for malaria to thrive must also be dealt with. Thus, the anti-malaria campaign must go on at two levels, that of treating people who have got malaria, and that of dealing with causes that promote malarial infection. Everyone knows that by dealing pro-actively with the issue of root cause, small pox has now been totally eliminated. The point we are trying to make is that while human activists fight Adharma in one way and at one level, the Avatars do their own bit for the sustenance of Dharma by functioning at an entirely different level. In the Dwapara Yuga, we see this very distinctly; while Arjuna actually waged war, Krishna taught the Gita. What this tells us is that it is unreasonable to expect the Sri Sathya Sai Avatar to function in the same manner and at the same level as we humans do. Where preservation of law and order in Society is concerned, there is a role for the Police Constable; likewise, there is also a role for the Police Commissioner; the two play complementary roles. God comes in human form to teach, guide and lead. Swami has come as the Divine Light of Pure Love to sensitise us to Sathya, Dharma, Shanti and Prema, particularly the last mentioned. Let us not denigrate Him by pulling Him down to our level. Rather, we must realign our priorities, and perform our tasks so that they conform to the long-term objectives that Swami has placed before us. We must follow the Master and not tell Him what He should and should not do! We are sure you would agree! All the best.